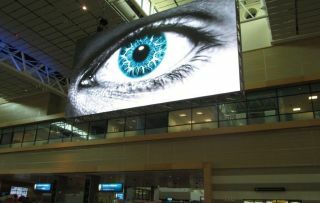 Airport Ads, a division of Provantage Media Group, has built an indoor screen in a southern Africa airport. The screen measures an impressive 8m by 5m (37m2) and is a high definition digital billboard that offers brands an advertising opportunity at Durban's King Shaka International Airport. The screen is the first in Provantage Media Group's new "VisioNet" network of large format digital billboards that will be rolled out in key high density nodes. The first VisioNet screen is positioned in the domestic departures area at King Shaka International Airport, offering prime real estate for advertisers wanting to communicate with a highly desirable upper LSM market. Mzukisi Deliwe, Director of Airport Ads comments, "With 347,129 passengers passing through the airport each month, the super-sized, full HD LED screen offers a platform for the advertising of luxury brands, services and products that would be of interest to the leisure and business traveler market. The screen fits in with the luxury environment of the airport. Furthermore, you can quite literally stand a metre away from the screen and enjoy the advertisement with clarity." Provantage Media Group's MD Jacques du Preez is extremely proud of VisioNet as it offers a highly visible and unique opportunity for brands inside King Shaka International Airport. "VisioNet is our venture into the large format digital landscape and will further entrench us as the leader in DOOH in Southern Africa, following our success with our digital place-based networks airport.tv and TRANSIT.TV."